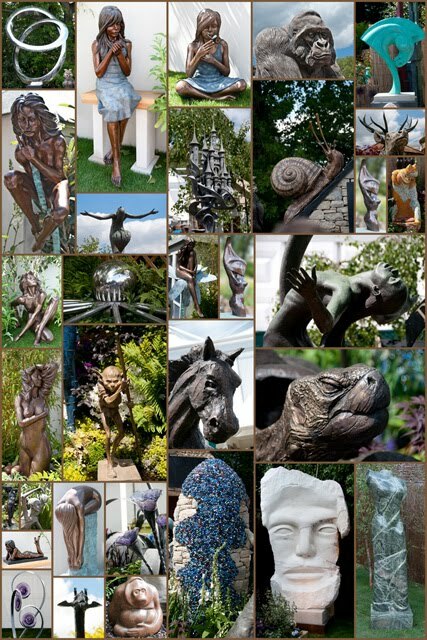 This is a collage of some of the diverse sculptures seen at the Chelsea Flower Show on Friday 28th May 2010. 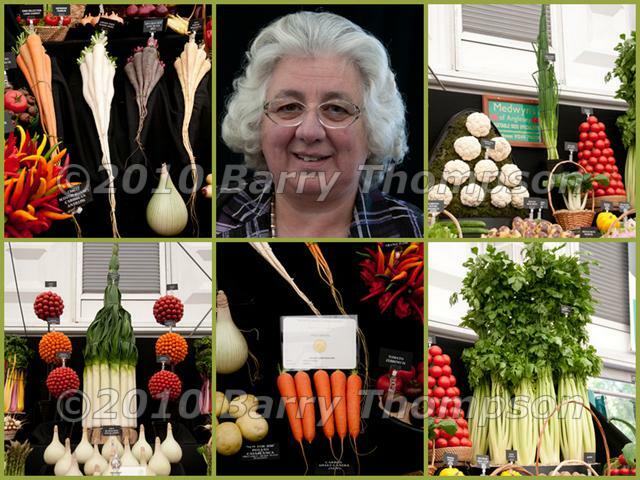 This is a collage of a small selection of the display which once again won the prestigious gold medal and was awarded to Medwyn Williams an Anglesey. Vegetable grower and exhibitor, at the 2010 Chelsea Flower Show. Medwyn wasn't present at the display whist I was there, however his wife Gwenda was and I had a pleasant chat with her for a few minutes. The Medwyn site is here. 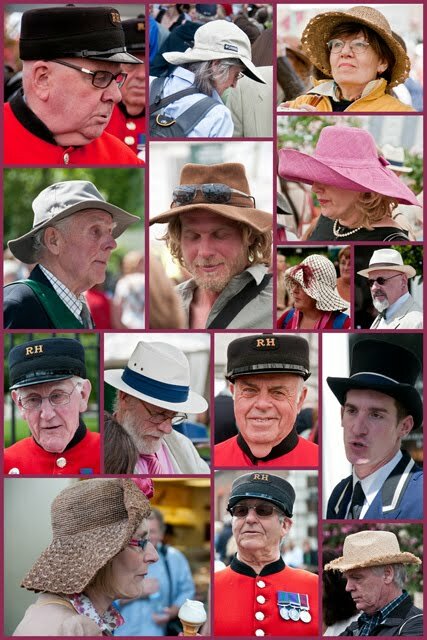 A panoramic view of the Royal Hospital Chelsea, the home of our much loved Chelsea Pensioners, "The Men in Scarlet". Website here the hospital was founded in 1682 by King Charles II. This image has been produced from a ten shot (10 x 1) hand held series of photographs, purposly taken off centre as the flag pole and its Union flag would have partially obscured the clock tower. Produced using Photomerge in Adobe Photoshop CS5. Hats seen at The Chelsea Flower Show on Friday 28th May 2010. 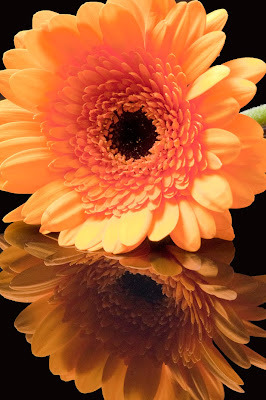 I love Gerberas, shot at our lighting workshop on Wednesday 26th May using Carol's Elinchrom studio lights. 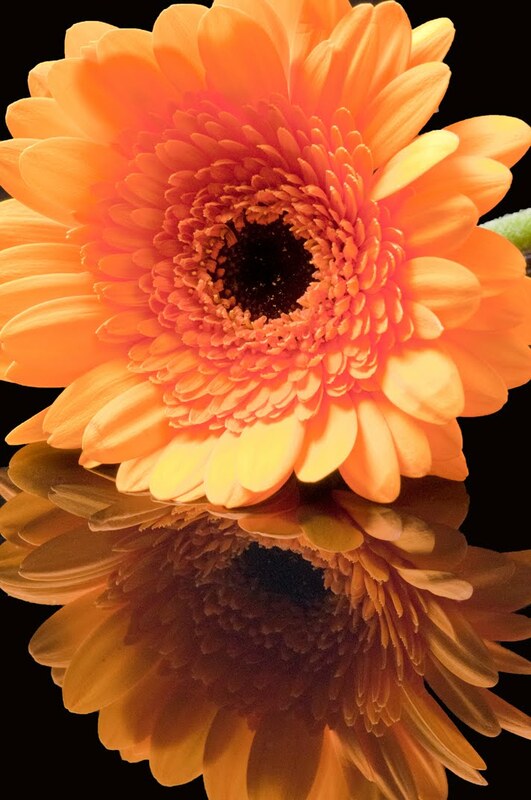 Gerbera placed on black Perspex to obtain the reflection. These are Barry's groupies who attended the six workshops at Chellaston School recently. 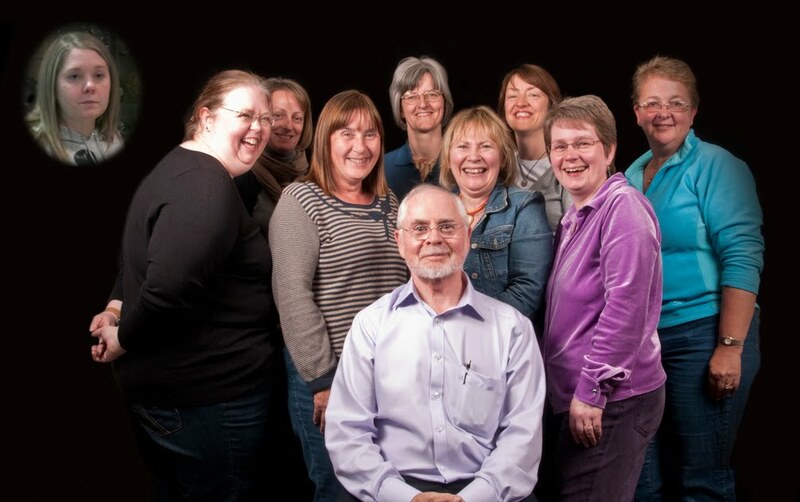 Kelly top left wasn't with us for the last workshop, then from the left we have Bernadette, Helene, Lilian, Janet, Annie, Carol, Nicky, Helen and me in front. A great bunch of ladies who it was a pleasure to be associated with. What a surprise, these two images with their combined score gave me first place in Derby City Photographic Club's open print competition on Monday 17th May 2010. Steve Roper, an excellent judge, had something positive, supportive and constructive to say about all of the competition entries. 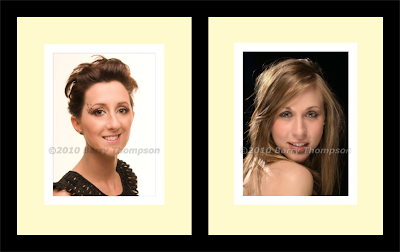 The portrait of Leah on the left scored 19 points out of 20 and the portrait of Laura on the right scored 18 out of 20, giving a combined score of 37 points. Why did the portrait of Laura score 18, the judge didn't like the pearl earing, he found it slightly distracting, so if I enter the image into other competitions perhaps I should call it "The Lady With The Pearl Earring" alluding to the portrait painted by Johannes Vermeer called "The Girl With The Pearl Earring" see here. 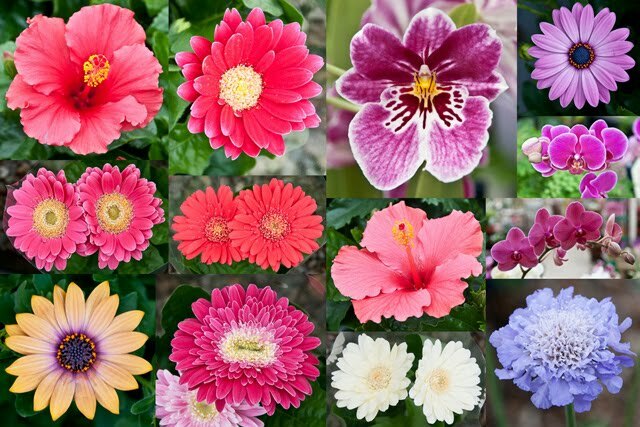 A collage of photographs taken at the Fairways Garden Centre, Hollies Farm, Clifton, DE6 2GN, Ashbourne, Derbyshire on the A515 on Sunday 10th May 2010. This image shows cowslips in Calke Park just adjacent to the Calke Abbey building, seen left of centre, created from a nine shot series of photographs taken on Saturday 8th may 2010 and Photomerged in Adobe Photoshop CS5. I used the new feature of content aware fill in Photoshop to fill in the surround of the image. Three shots of cowslips taken at Calke Park in an adjacent meadow to the ones shown above. 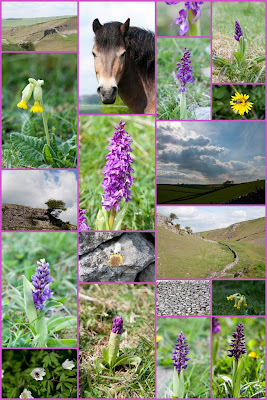 Photographed wild flowers, horses, landscapes, walls, lichens and field patterns during the afternoon of 7th May 2010, during a Photowalk organised by one of our club members as part of the Peak District & Derbyshire Walking Festivals. Website here. Fourteen people took part in the walk. The orchids, cowslips and other flower photographs were taken in Litton Dale which displayed an abundance of these delightful flowers. 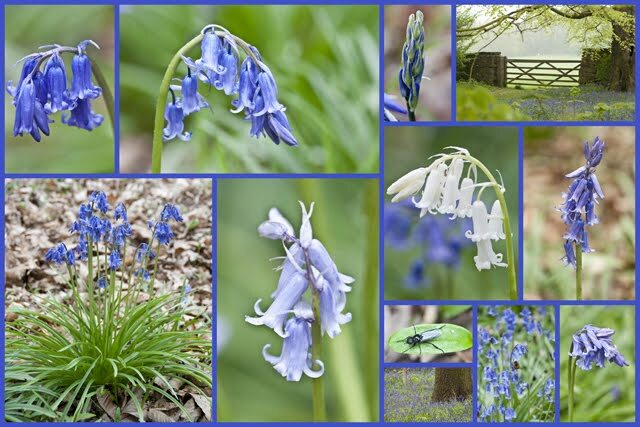 There is something magical about walking amongst Bluebells, their varietal colouring and such a wonderful delicate perfume too. Photographs taken in Calke Park on Thursday 6th May 2010, collage created in Picasa 3.